Overview (No Spoilers): Having finished my latest audiobook during my last training run the night before my half marathon I was desperate for a fast paced, suspense filled novel to get me through the race. 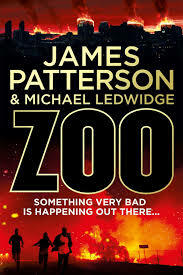 I typically do not enjoy James Patterson’s writing style, however I thought the fast-paced cliffhanger packed narration would be ideal to keep me occupied during my 2:35 hour race. While, I was entertained, I found the main character of the Zoo, Jackson Oz to be infuriating. Oz is arrogant, sexist, and often reacts without thinking of the consequences. Patterson fails to have one strong female character in the book, which also frustrated me to no end. Natalie, a focused med student, comes off as whiney and needy. Beautiful, smart Chloe, the French scientist, is weak and need Oz to save her, while also being prone to panic attacks in stressful situations. The President of the United States, also a woman, is so devastated by a loss that she is not able to make sound decisions. Overall, as a scientist I enjoyed the concept of the book, however I disliked almost all of the characters and their subsequent interactions.